This baby powder protects your baby's soft delicate skin. That's why they have designed Johnson's baby powder to protect baby's skin from excess moisture and leave it soft and smooth. It’s a classic. 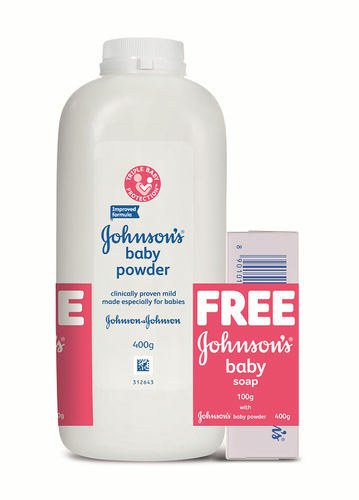 Johnson's baby powder helps to eliminate friction while keeping skin cool and comfortable. Unlike adult powders, Johnson's and Johnson's baby powder is safe and is made of millions of tiny round slippery plates that glide over each other to help reduce the irritation caused by friction and thus providing soothing comfort to your baby. With a clean, classic scent, this incredibly soft baby powder formula awakens and stimulates your baby’s senses making your baby feel fresh and letting your baby play happily with everyone. Your baby's skin has a natural protective coating of moisturizing oils that covers her skin's outer layer. If these oils get washed away, you might leave her skin vulnerable to dryness, irritation and rash. That's why Johnson's Baby Soap, made especially for babies, is enriched with 1/4th baby lotion and vitamin E to help preserve baby skin’s moisture. It's rich, creamy lather gently cleanses and helps keep your baby's skin soft and supple. It does not contain any parabens or phthalates and is a dermatologist tested product. Johnson's Baby Soap has been specially designed to have an easy grip shape. Moms trust Johnson's - always mild, gentle and effective.